Sometimes it’s OK to pat yourself on the back, as long as it’s not too often and you really deserve it. Wednesday, September 21, the new edition of the completely redesigned Flagler News-Tribune launched with a small banquet-style ceremony at the Flagler Auditorium. 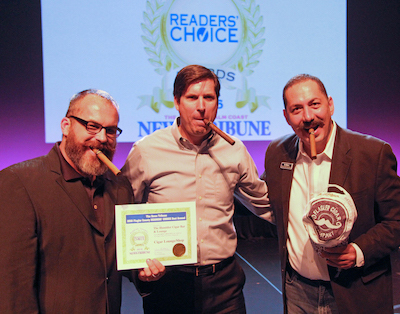 In conjunction with the debut, the 2016 winners for the Flagler News-Tribune Readers’ Choice Awards, also known as the Daytona Beach News-Journal “Best Around,” were recognized. And that is an occasion worth celebrating. We were pleased as punch to learn that 12 of our Office Divvy clients walked away with Readers’ Choice certificates to hang either in their establishments or, alternatively, on their refrigerators. A certificate may just be a piece of paper but there’s nothing better than the moments you realize you’ve aligned yourself with the right people, or, in this case, “winning companies—especially when you know you acted as a starting player during their championship run. It’s just as good when that same superstar company decides the same by you. When Office Divvy settles on a client, we go in with the attitude that this will be a mutually successful relationship. There is no better illustration of this paradigm transpiring than at the Readers’ Choice Awards. We briefly caught up with two such clients at the banquet, Dr. Paint and Killian’s Seamless Gutters and Screens. We asked them if they had any words of wisdom following their big wins. One commonality that you’ll notice below is both companies value Customer Service and Customer Engagement as much as they do their touted product/service. Dr. Paint and Killian’s take advantage of our Professional Phone Answering and we provide office space for Dr. Paint, as well. We also consult both companies on their digital strategies. One way Omar, and his wife Katherine, try to do that is by keeping in touch with their customers on a monthly basis, and really going the extra lengths to do that. One example: “That could mean newsletters, blog posts—well, mostly newsletters,” Omar said. Katherine answered the follow-up: What do they write about? House painting isn’t exactly the most interesting of topics. Office Divvy has helped Dr. Paint flesh out who that customer is. And in turn, Dr. Paint is never taking their customer relationships for granted. She went on to say that, because Office Divvy has them covered on the phones (which ring constantly) the company itself can shift their focus solely to the customer, especially when they’re giving free estimates. “That’s a big deal—not multi-tasking,” she said.